There are a number of good options available for those of you that shoot RAW. Your camera most likely comes with an application (like Canon's Digital Photo Pro), and if you use Photoshop you already have Adobe Camera Raw. So, why would you be interested in investing in yet another application for processing your images? As photographers, we're all interested in the absolute best possible image quality. That's why many of us use RAW to begin with. After all, capturing in JPEG is less post processing work for us since so much of it's done in camera. But, I haven't met a photographer yet that was happy about giving up control over how their images are processed. Capture One from PhaseOne (www.phaseone.com) has been around for quite a while, and has always been one of the stronger competitors in this market. Available in a standard version as well as Pro, this review looks at the Pro version which is likely to be the choice you'll want to examine as it includes a number of features like lens correction, styles, selective color adjustments, and other workflow enhancements. 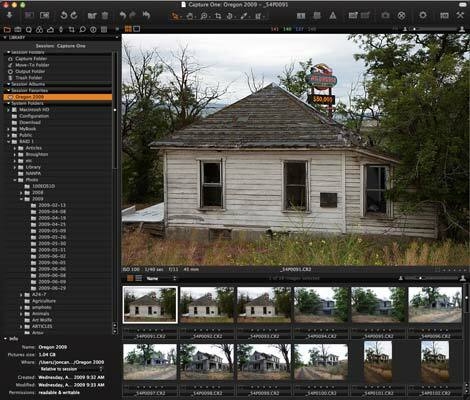 One of the major new features in version 4 of Capture One Pro is the ability to work on JPEG and TIFF files with all of the tools in the program, all as non-destructive edits. This is something that Lightroom and Aperture users have been enjoying for some time, and is a great option for anyone that shoots in JPG. You're still limited to what a JPG file can do in some respects, and you have less image data available when making adjustments due to the 8-bit restriction in a JPG image, but it's still considerably more powerful than typical image editing on this type of file would be. Capture One Pro sports a new interface using the now popular dark gray background (Figure 1). The work area can be change to use different colors from the Preferences dialog. I prefer to work with a medium gray background to better judge highlights and shadows. File importing is where most people begin, and Capture One Pro does a very good job of handling this task (Figure 2). 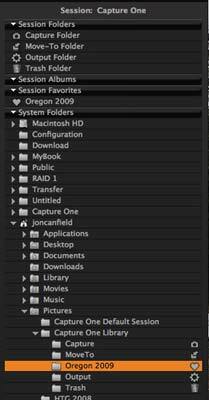 You can select the location you want to copy your files to, as well as create a backup copy. The metadata tagging is very simplistic, only giving you Copyright and Caption fields. Folders that are created during the import process are automatically flagged as Favorites and placed in the Session Favorites panel to make it easier to work with current images (Figure 3). This brings us to one of the workflow features of Capture One Pro - Sessions. When you're working in the application, you work with a Session - the set of images being edited at that time, including the layout of the workspace and any session related folders and albums you created. 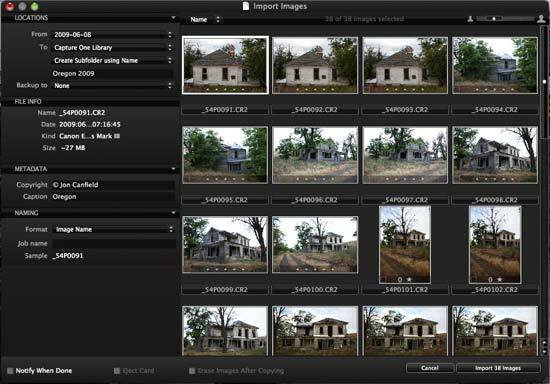 Capture One Pro also includes Albums, which are similar to Collections in Lightroom and Albums in Aperture - they contain virtual copies of your images and can include images from multiple folders. In figure 4, I have a Session Album named Travel 2009 that contains images from both the Utah and Oregon folders - deleting images from the album will not delete them from the folders because these are just virtual representations of the images. Where Capture One Pro differs is that albums are tied to a session and not a global album that will be there at all times (unless, of course, you use the default setting and never save a custom session). Sessions can save a great deal of time though by customizing the interface and the folders for specific needs - as an example, a photo session with Erin would be saved as a Session that contains all the favorites, albums, and other temporary folders. 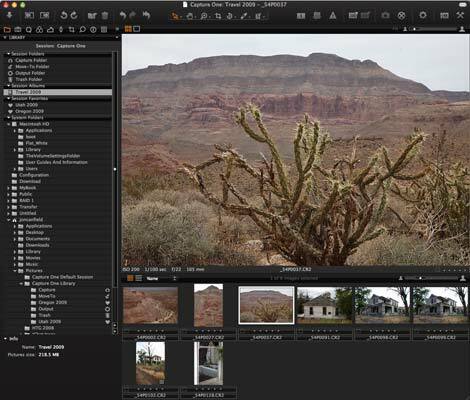 Capture One Pro breaks the image editing controls into logical groupings. The panels are docked by default, but you can drag any panel away from the dock to turn it into a floating palette (Mac only according to the documentation). The Quick panel (Figure 5) gives you access to the most commonly used adjustments - white balance, exposure, and high dynamic range adjustments for shadow and highlight recovery. There are also a number of Styles available which are preset adjustments to modify your images (Figure 6). I find the histogram display in Capture One Pro to be the best of any image editing application I've used - it's extremely responsive and does a very good job of conveying the color channel details in a small area. The Color panel (Figure 7) gives fine tuning control over white balance and color adjustment. The Skin Tone adjustments work in a similar way to the white balance adjustment, but rather than neutralizing an image based on the selection, the Skin Tone lets you preselect a color value to adjust to, making it easy to exactly match a color as needed. The Exposure panel (Figure 8) has the exposure and HDR editing controls as well as a Level and Curve tool. 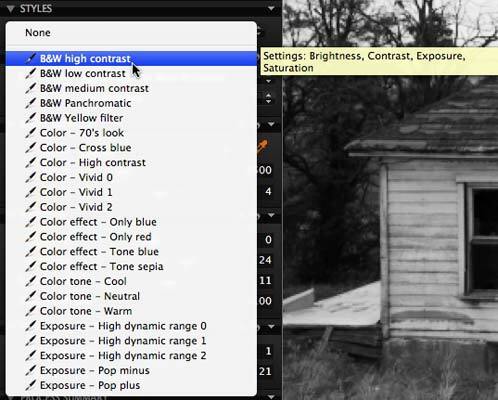 Using levels you can set the black and white points of your image by using the eyedroppers. The midtones can be adjusted as well by dragging the marker. Curves can be set by dragging at any point on the curve, or you can fine tune the area you want to adjust by clicking with the eyedropper on specific areas of your image. Capture One Pro will place a point on the curve at that light value.